Have you ever been talking with a friend, only to stop and wonder how you ended up talking about a particular topic? It's so easy to flow from one thing to another, and then another, that sometimes it's hard to trace how the conversation went from where you started to where you were by the end. Prayer can be like that, too, if we let it. Sometimes when I pray I have a particular thought in mind when I start and I try so hard to keep myself focused on that one thing, but my mind keeps wandering in all sorts of different directions. It gets frustrating because I feel like I should be praying only about this one thing, whatever it is, but other thoughts keep getting in the way. Or maybe I'm trying to pray according to a particular 'formula' - first praise, then thankfulness, then requests for others and so on. But those random, distracting, thoughts keep coming and taking me out of whatever I'm trying to pray. I'm guessing you know what I'm talking about. So why not just lose ourselves in those distracting thoughts, allowing ourselves time to talk to God about each one of them? Obviously they have some measure of importance in our minds or we wouldn't be thinking about them at all. Rather than forcing them away, why not include them in our prayers, asking God for help in those situations, if needed, or praising Him for them if that's what is required. If it's worry that is coming to mind, then that's all the more reason to bring it to God rather than trying to banish it. Peter tells us to "Give all your worries and cares to God, for he cares about you" (1 Peter 5:7). All of our worries and cares are important to Him, even the ones that may seem trivial to us. If it keeps coming up in your mind, then talk to Him about it and let Him help carry the burden. Paul wrote, "Don’t worry about anything; instead, pray about everything. Tell God what you need, and thank him for all he has done. Then you will experience God’s peace, which exceeds anything we can understand. His peace will guard your hearts and minds as you live in Christ Jesus" (Philippians 4:6,7). I love the notion of telling God what we need and thanking Him for what He has already done. That encompasses everything, doesn't it? Lastly, Jesus Himself asked, "Can all your worries add a single moment to your life?" (Matthew 6:27). Obviously, the answer to that is a resounding no, so it makes sense to do whatever we can to stem the tide of worries rolling through our minds. Talking to God about what worries us may not immediately change the situation, but it can easily relieve our minds, which is often just as good. 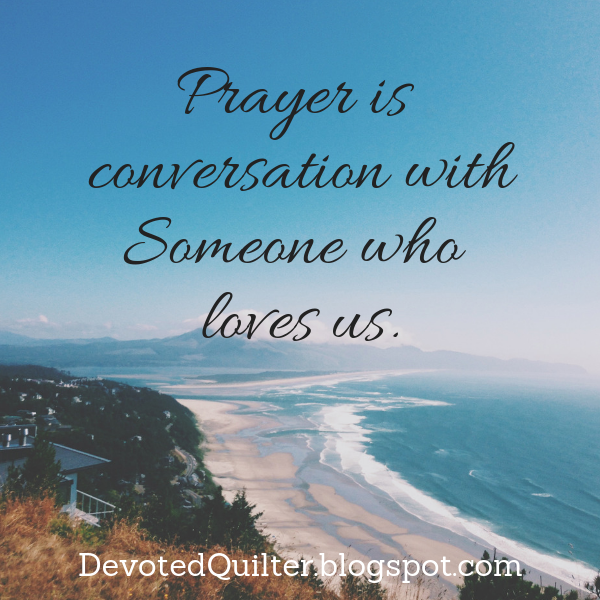 Prayer is not supposed to be intimidating or difficult. It's a conversation with Someone who loves us and is interested in our every thought and feeling. So let's share all of them with Him.